I’ve always loved to read, and remember reading several books at a time as a teenager. Secretly reading novels during boring economics classes, and being totally lost in a book, wherever I was. Now, with three kids and a busy job, I don’t always find time to read. However, there’s always a point when I start missing books too much, and pick up reading a again. And well, currently I.am.reading. On the train, in bed way beyond bedtime, a book in my bag wherever I go, reading more to the kids before they go to bed, even listening to novels on Storytel while working out or washing the dishes. But how green is reading. All that paper, all those trees? What’s better? An e-book or a paper book? I use both actually. I feel infinitely rich having a dozen unread books on my Ipad, but I do prefer the look and feel of actual paper books. I did some research online to figure out what was better: paper books or e-books, and well, the answer isn’t always clear. In general, it seems, reading e-books is better for the environment if you read a lot of books, if you use a device you already own and also use for other purposes ( like an Ipad), and if you use your device for a long period of time. Paper books are increasingly printed on recycled paper or on paper with the FSC quality mark, and the wood of which paper is made is after all a renewable resource. But still. When reading e-books or listening to books, I use my Ipad, and I’ve had it for several years and many more to follow I hope. I look for books, for myself and the kids at thriftstores. You’d be surprised how many beautiful and new-looking books you can find. I share my books with family, friends, colleagues at work. Some books go round and round from one person to the other for months. There are books I’ll always keep, but those I’ve read once and don’t wish to keep, I give away or sell online. Off they go, to a second life. And then of course there is the library, where one single book can be enjoyed by many. 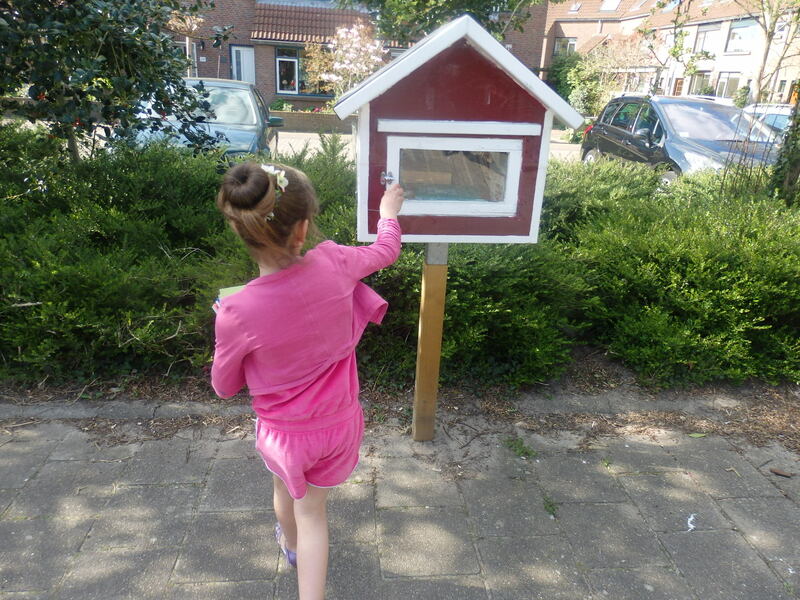 We also have two ‘Little Free Libraries’ in our neighborhood, where we occasionally bring some books, and find some ‘new’ ones to take home. Oh oh oh 2016, what happened blogwise? After several months of happy cooking, baking, reading, crocheting and – don’t forget – blogging about it , all went silent in the summer. Health and everyday live took all my time and attention, and blogging became just about the last thing on my mind. I did a little crochet, made two lovely baby blankets but took no pictures. I cooked a meal everyday, but stopped experimenting. I hardly baked a thing, but fortunately, I did read another book or two. Some of the loveliest ones where books I read with my eldest daughter: the Dutch ‘Gips’, by Anna Woltz, and ‘The thing about Jelly Fish’ by Ali Benjamin. For 2017, I did not make many resolutions, other than ‘going with the flow’ and trying to be gentle, with myself, the people and the world around me. Oh and yes, to keep reading ofcourse, to be a bit more creative, and to try and blog again every once in a while . Let’s see how that goes. To keep track of my reading ‘history’ I started a new list of books. Let’s see if I’ll be able to add some recipes and crochet projects to my lists aswell this year. Well, the first book of 2016 is a fact! And it was one that put a smile on my face, and made me think. Brooke Davis’ debut: Lost and Found is the story of Millie Bird who travels all across Australia looking for her mum, who left her behind in a department store after the death of her husband. On her somewhat surrealistic roadtrip, Millie is accompanied by her elderly neighbour Agatha and Karl the typist, each of them struggling with the loss of their loved ones and with life itself. The story of their journey is told from the perspective of Millie, and of her two elderly companions. I took this book along from the library, mainly because I fell for the cover, and the brief description on it. I had no idea there was a complete website behind the book (which is where I found this little film too). If you are looking for a book that will put a (sometimes sad) smile on your face,and will keep you reading, here is one. What’s the first book you’re reading this year? Inspired by Sue Quinns ‘Everyday Sugarfree Cooking’, I decided to experiment a bit with using (dried) fruit as sweeteners in some of my favorite recipes. In her book Sue Quinn clearly explains what refined sugar does to your body and why it’s not good for you. The book is also filled with 65 delicious recipes. This time not using stuff like agavesyrup to replace sugar, but using (dried) fruits as a source of sweetness. And that, I tell you, is very inspiring! Her recipes are sugarfree but not necessarily vegan aswell, some are though, and with some creativity you’ll come a long way with the non-vegan ones. The granola and crumble I made are not recipes out of this book, but where inspired by it. Next time I’ll be making stuff right out of the book. There’s a jar all set and ready, waiting to be filled with Sue Quinns home made sugarfree ketchup. And her chocolatemousse made with dates and coconutcream made my mouth water just by reading the recipe, yumm! wet ingredients: coconut oil and some organic sugarfree peanutbutter. I mixed it all together, and baked for another 5 minutes. After letting it cool down I stored the granola in a jar in the fridge. I must say it’s a bit less sticky than the one I made last week, perhaps because of the lack of sugar. But…later today I found out that my foodprocessor is quite capable of mixing dates, apricot and coconut oil into a sticky, sweet paste, so that’s worth a try on making the next granola batch…learning by doing so to speak…..
For desert I made an apple crumble, using organic apples that I found at our local supermarket, and some cinnamon. For the crumble: a mixture of oats (grounded in my foodprocessor until it looked like flour), some semolina, ground walnuts and some grated coconut. To turn it into a crumble, I added a mixture of coconut oil, dates and dried apricots. I let the foodprocessor do its magic, having it work for about a minute, and got a really sticky paste. I added the dry ingredients, spread everything out on top of the apples, and baked in the oven for 20 minutes at 150 degrees. The outcome was tasty, sweet and crumbly…yes crumbly…but oh so tasty! I think this calls for some more experimenting, but the beginning is promissing. I’ll definitely use fruits as sweeteners more often, I’ll experiment some more with my crumble and granola, and I really should start making the recipes from Sue Quinns book! PS: I was a bit terrified to try at first, becaus what if they’d break? But it turned out these milkglass dishes I hunt for in the thirftstore are very good at standing the heat, and are very suitable for baking. I’m happy…they come in so many sizes and designs, can be found in most thriftstores, and doesn’t every dish look prettier in a bowl like this? There’s a Little Free Library in our neighbourhood. 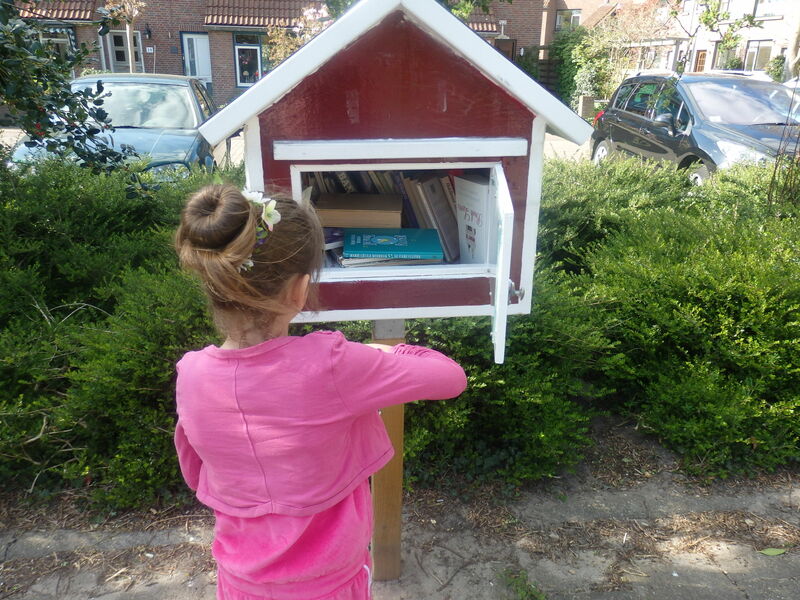 Every now and then we take walk over there, play for a while on the playground next to the Little Free Library, bring some books from home and leave them in te ‘Library’ for neighbours to read. I also like to browse through the books available and pick something new to read. It’s always a surprise, the Library is full of unexpected treasures! It’s a great way to give your books a new destination. After all there are only so many books we read twice, right? Bij ons in de wijk staat een ruil-boekenkastje. Af en toe ruimen we thuis onze boekenkast uit, en brengen een stapeltje boeken naar het boekenkastje. Even spelen in het speeltuintje, boeken wegzetten, en even neuzen wat er allemaal voor moois in het kastje staat. Fijn! Vaak gaat er ook weer een mooi boek me naar huis. Best een toffe bestemming voor je boeken, toch? Want zeg nou zelf, hoeveel boeken lees je nou echt meer dan eens?